The Artful Maven: The Greatest Game Ever Played!?! Well....according to my hubby and sons anyway....and hockey being a close second! What is it about that little ball going into a hole anyway? 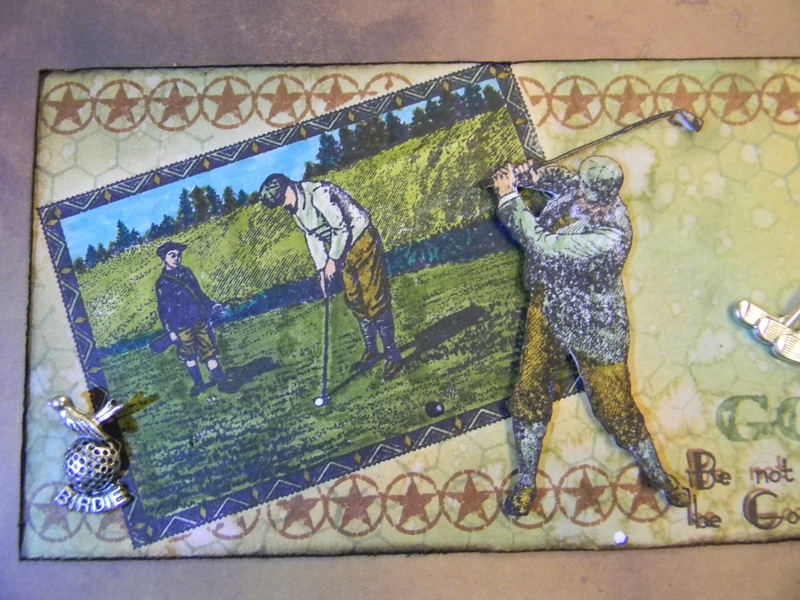 I've often joked, although I am not sure it is a joke, that I am my husband's mistress and Golf is his wife! He just won't and can't give her up for me! Truth be told though, I wouldn't have it any other way. He gets wonderful exercise, because he walks instead of rides, and I love what winning does for his psyche. Now my boys have the disease, and I love the extra time that they now spend with their Daddy...it's priceless! So with all that being said, I was so happy to see what the challenge was at Our Creative Corner this week, hosted by Irena "Rudlis" Kowalczyk of Love Life and Crafts. Let's see "Men's Passions, Hobbies, or Interests". Show what hobby your husband, father, son, brother, or another male member of your family has. Does he likes sports, cars, or maybe making models? In your post please tell what their passion is. Have fun visiting the other Design Team members for inspiration, or really just to see what they have to put up with from the men in their lives! 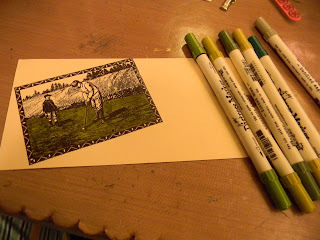 I stamped the image in Jet Black Archival and then colored it in with Distress Markers. I used every shade of green I could. I love this image...the pictures are not doing this tag justice. 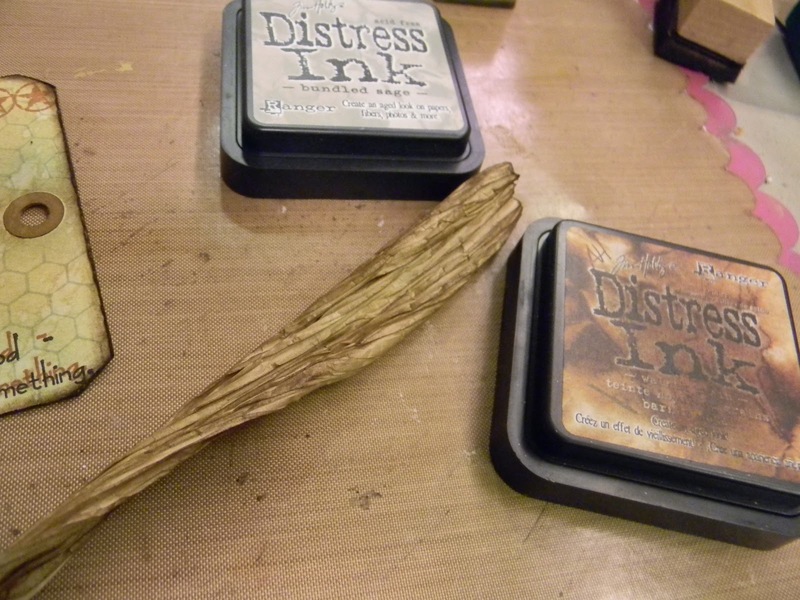 I inked and flicked water on the ink while covering my up with paper for protection. It sort of looks camouflaged...I like that! 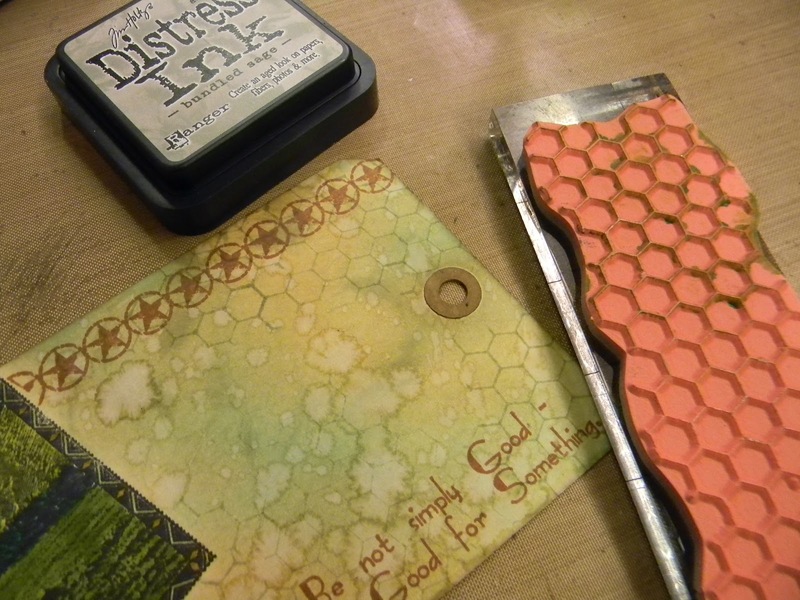 I stamped the 'stars' and sentiment on in Sepia Archival Ink and the 'honeycomb' in Bundled Sage Distress Ink. I stamped on another layer of the senitment to really make it pop, buy from far away it looks fuzzy, although it really isn't. 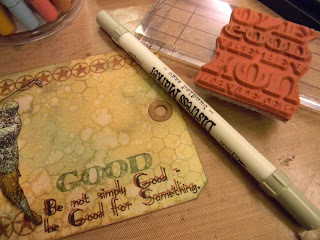 The 'good' is stamp in Distress Marker. I untwisted a little of the kraft ribbon and inked it on the raised portions with Bundled Sage and Gathered Twigs Distress Inks. The edges of the tag were distressed and inked with Walnut Stain Distress Ink. 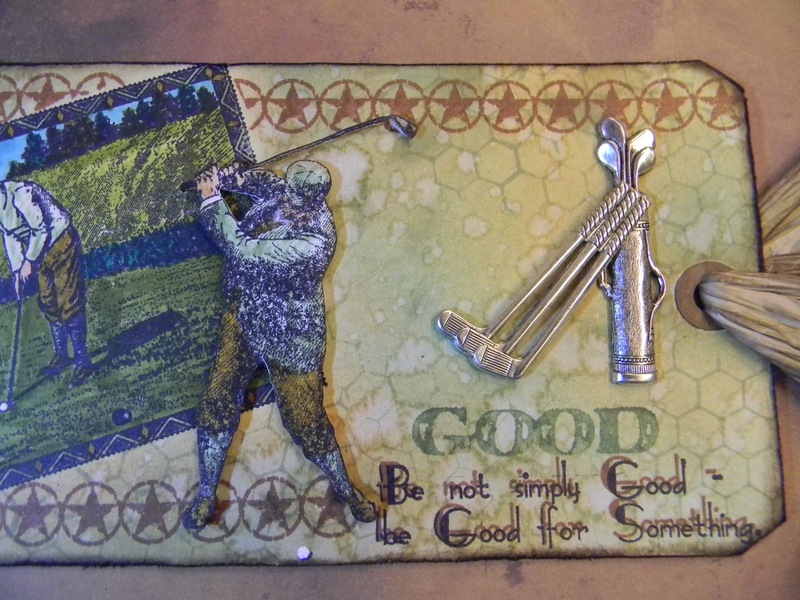 I think you have coloured up this image amazingly with distress markers, your Tag shows texture and dimension with your added elements. But it is the Bg that I just love the most. I don't get golf either, or cricket for that matter. :) This is a very cool tag. The colours are fab & that little birdie charm is very cute. I knew this one was yours without even looking who did it on the OCC blog! Seems to be more than one golf widow on the OCC design team though!Very cool tag. 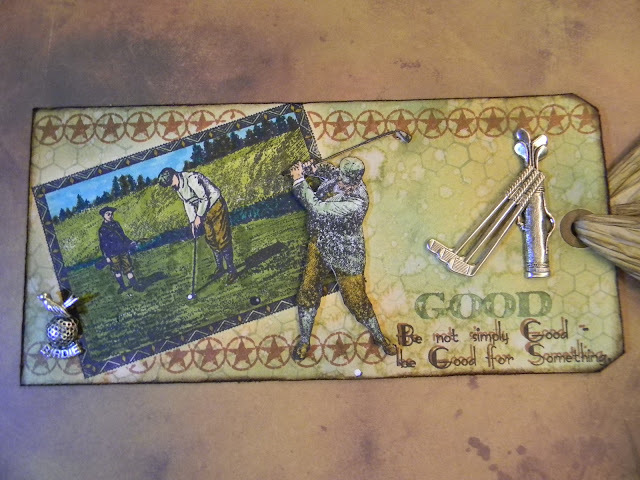 Hope your golf-loving hubs liked it. This is great Anita ... your colouring is superb, your background technique is fabulously creative and the silver charms are oh so perfect!!! P.S. My Dad would've hung this on the wall it is so pretty! 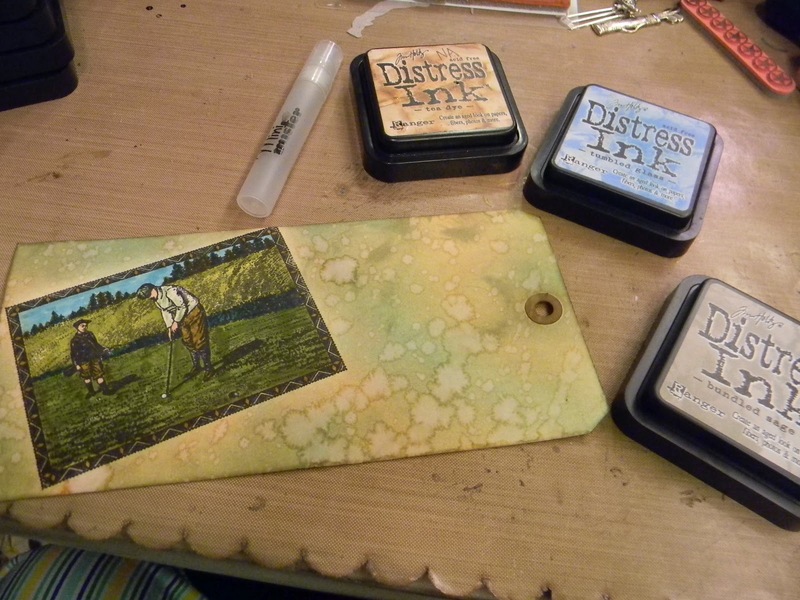 Love this tag, you colored those stamps beautifully! The background is amazing too! Anita, I couldn't wait to see what you created for this weeks challenge. And you surely didn't disappointment me! I just love your tag! and you always show us how to make our own. I love that too! I like all your golf additions, very creative and purposely placed. What a fabulous tag! Hope you hare having a wonderful weekend. hugs, sharon w.
Anita this is a wonderful tag. I love the different background effects and textures you used as well as the adorable charms! Great job! I think "golf" stole the show! Have a great week! What a fantastic masculine tag! Love the background, especially. That star stamp is perfect, too! This is such a beautiful tag. Love the background and all the details are fabulous!!! 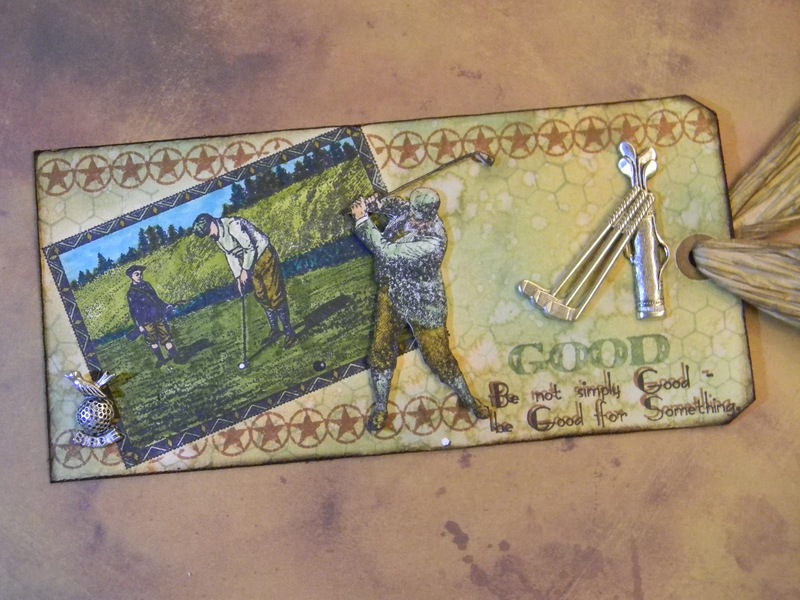 I never played golf, but your tag is FABULOUS and thanks for showing how you did this! LORDY you're talented! This is so amazing, the background and the images are so fantastic. I love those silver accents too - all just gorgeous!